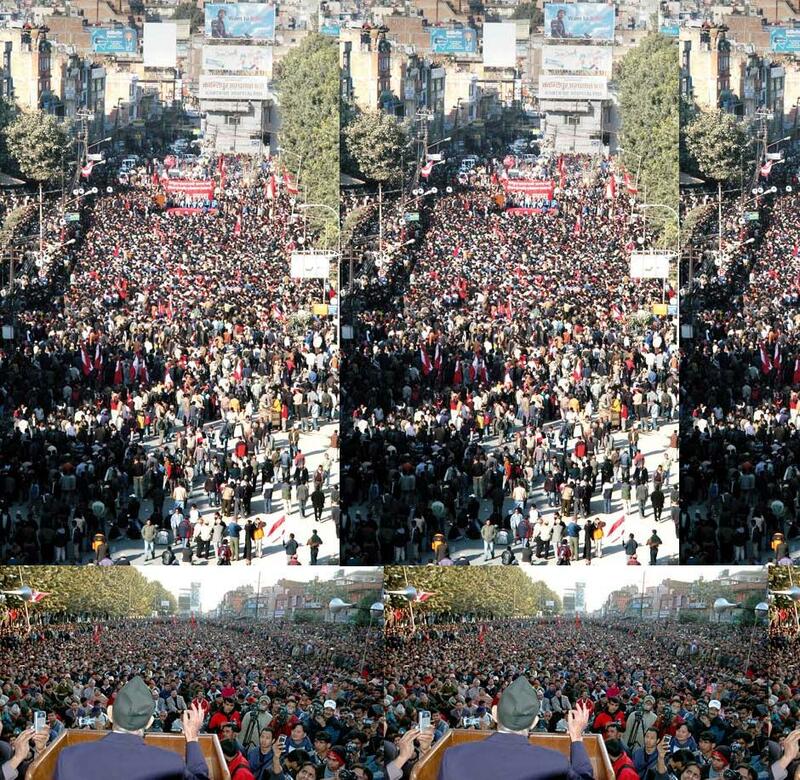 On December 2 the UML held a rally in Baneshwar and 100,000 people or more showed up. Yesterday it was the seven party coalition at the same place with over 20,000 people. 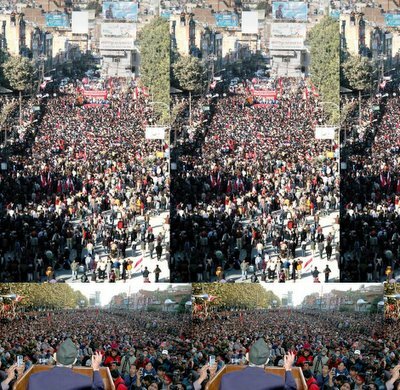 Before that the UML managed to show 100,000 people in a place like Butwal. It was able to mobilize a few districts at once. The UML also had impressive shows in other places. A few days after the UML rally on December 2, the Nepali Congress had a poor rally in Biratnagar, supposedly a bastion. The crowd size was more like 20,000. It was a much smaller crowd it showed in Bhaktapur. What is going on? For one, the ground reality is that the Nepali Congress is no longer the largest party in the country after its vertical split. But then if the UML can get 100,000 people, for the seven parties it should be 100,000 plus. But instead the numbers go down drastically. What's going on? I think it has everything to do with a fundamental lack of clarity and coordination. The UML has clarity. It has come out for a democratic republic. But the seven party coalition has been held hostage by the Nepali Congress. That alliance is not even solidly behind a constituent assembly, let alone a democratic republic. Girija's plan is to revive the House and then revive the 1990 constitution. You don't need a revolution for that. If that be your goal, you are better off participating in the king's elections. The Nepali Congress has a right to pick and choose its political stances. That is what democracy is. It can pick the leader it wants, it can pick its ideology, it can make its policy choices. But instead of secretly fantasizing about reviving the 1990 constitution, the Congress has the option to pick parts of the 1990 constitution it likes and then fight for those elements in the next constitution. A constituent assembly will allow that. The seven party alliance does not have to come out for a democratic republic, but it does have to unequivocally come out for a constituent assembly. That it has not. Unless the House revival stance is ditched, the alliance's commitment to the constituent assembly is suspect. That is not me preaching. That is what the people seem to be saying with their feet. Just look at the numbers. The people are not afraid of the king, the army, the police or with Tulsi Giri. The people are not afraid. But they need a clarity of vision from the seven party alliance that has so far been missing. An interim government under an interim constitution that will take the country to a constituent assembly is clarity of vision. The House revival idea is not. This is not a minor issue. This is the key issue. This is what is holding everything back. This is what made the king's misadventures possible. This has been the blunder of the decade. The House revival idea does not excite people. That idea does not fire their imagination. Autocracy is wrong, a communist republic would be wrong, but the 1990s were no heaven. The House revival idea is a promise to take the country to the past. The past was not that good. The people want to move towards the future, a bright future. A constituent assembly would be that bright future. And the seven party alliance needs to have a permanent committee of seven individuals that meets at least once a week. No such thing exists. No wonder there tends to be little coordination. But then there is a mirror image of the same among the diaspora Nepalis. For the longest time the prevailing mood was that only moral support was to be extended. Organizations would labor to put out press statements. Those too would be few and far between. Finally there was this shift of mood. Moral as well as logistical support was to be extended. That was nothing akin to the Maoists moving from a communist republic to a democratic republic. And I feel that more strongly more time that passes. Then the next big achievement was to identify these five projects that we were going to work on, and we are working on. (1) Join one of the five projects, donate $100: Nepal 5, Nepal 1000. (2) Critique the Proposed Constitution. And the house collapsed. I got kicked out of the online forum: NDF Owner, Stop This Nonsense, Reinstate Immediately. I think I have some idea now how Baburam Bhattarai might have felt under "protective custody." I had been incorporating all suggestions that were being brought forth. I suggested raising money online and I created a webpage. There was this major hue and cry. I incorporated literally every single alternate idea that came along. Why? Money is good no matter how you raise it. All money raising ideas are good as long as money gets raised and book keeping is transparent, some at the level of all peoples, some only at the committee level. People complained I seemed to be getting a lot of publicity and was looking like the leader. I suggested a cloud model of group dynamics, not because I am publicity shy, but because I concluded that would be the most efficient, effective way. Your "glow" in the galaxy is directly proportional to your activity level. And there was to be no barrier to entry at any level of involvement for anyone. Level 8: Be part of more than one project. Level 9: Be part of all projects. Level 10: Be part of all levels and all projects, and constantly be looking at the big picture. I guess this would be put me at level 10. But that is still not a pyramid. Why? Because there is no barrier to entry for anyone at any level. Nothing prevents anyone else from also getting involved at Level 10. You will have access to the same news sources, the same discussions, the same data, the same numbers, many of the same people, many of the same phone numbers. The more the merrier. It truly is. But then there are hitherto unnamed people who secretly believe they are the chairpersons of the whole thing. That would not be as offensive if they were actually putting in some work. But to them it is a status thing. Work or no work, they are at the top. And they don't even have names, many of them. The work has been slightly disrupted, temporarily, but it has not been stopped. I am going to keep working the underground to try and get me reinstated to the Nepal Democracy Forum. But I already have had people call me and suggest the comments sections of this very blog would be a better forum. For one, it would be open. I dig the idea, kind of. There are less than five active people at that forum in the first place. This blog has a much wider readership than that forum. But I do want to be reinstated. Another thing that came up is quite a few people at that forum are leery of attaching their names to the work being done. It is perfectly okay for them to work anonymously or to not work at all. But they go one step further: they stop the work! They get in the way! They will not do it themselves, and they will not let others do it. And these are people with sound democratic credentials. Speed of execution of plans is not an issue to some of these revolutionaries. I believe I have given sound answers to every single criticism that got heaped my way. And if there are more, I would be more than happy to take them in the comments section right here. Criticisms on fundraising methods, criticisms on hiearchies within the movement work, I have dealt with them all. If you want to glow brighter than me, put in the hours. Don't begrudge that I am glowing. As far as I am concerned, publicity is the biggest chunk of the work. The more noise we make, the better for the freedom fighters in Nepal. So don't be complaining that we are partly succeeding. And there is to be no compromise on free speech. It is weird that so many Nepalis with such advanced degrees from major American institutions do not get free speech. Free speech does not come with ifs and buts. I have heard some really weird excuses. "Oh, but we are family." "We are just a group of friends." "What you are saying is right, what is not right is the way you are saying it." "Such and such has such and such degree from such and such place." It is okay to say all those things and more, but it is not okay to say that or anything else and go ahead and curb free speech. If you disagree, you express your disagreement, you don't proceed to shut up the other person. Maybe the seven party alliance and the diaspora Nepalis are not that different from each other.